The 36.58 metre motor yacht Sonas has been sold by Bob Cury at RJC Yacht Sales, who represented the buyer, and Mark Osterhaven at Worth Avenue Yachts, who acted for the seller. Sonas was built by US yard Broward Marine and delivered in 2002 as reportedly one of the most well equipped yachts the yard has ever produced. Ten guests are accommodated in an on deck master suite and four VIP queen cabins – all with en suite bathroom facilities. Features include a vast flybridge with a custom-made hard top, new Jacuzzi tub, island bar, a custom tender and a variety of water toys. Her main saloon has panelling and joinery in cherry wood and mahogany with insets in hand crafted Italian fabrics, while large couches and armchairs face an entertainment centre, including a 40 inch plasma television screen. Forward is a formal dining area seating 10 guests. Further forward still is a new galley and a dinette with bench seating for casual breakfasts and snacks. _Sonas _is powered by reliable 3412 Caterpillar main engines, and has a 13,000 gallon fuel tank giving her an extended cruising range of 2,500 nautical miles at 12 knots. 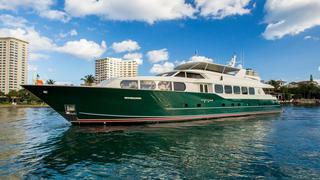 She was offered for sale by her second owner and has never been chartered. Her hull was repainted in hunter green in 2011, and her white superstructure was repainted in 2010. In 2014 a major refit included a complete new interior with furnishings, carpeting, galley appliances, audio/visual systems, mattresses and LED lighting throughout.